Add an easy, colorful touch to your Halloween decor with this glitter drip pumpkin! Wipe the pumpkin down with a damp cloth to be sure it’s dust and dirt free. Apply a coat of StarLite varnish, which is a clear sealer with glitter in it. It goes on milky but dries clear. Allow it to dry. Place the pumpkin on a piece of wax paper and drip glitter paint from the top of the pumpkin so that it dribbles down the sides. Allow it to dry for several hours, occasionally moving it so it doesn’t stick to the wax paper. 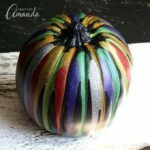 This project for Glitter Drip Pumpkin was printed from CraftsbyAmanda.com - https://craftsbyamanda.com/glitter-drip-pumpkin/ and can only be printed for education or personal use.